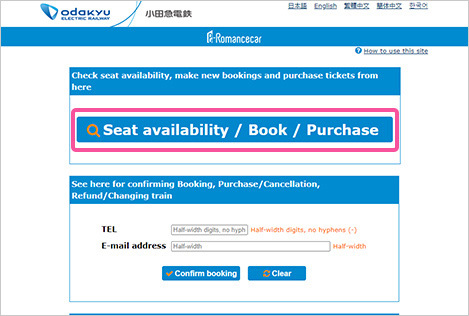 With your browser open to the e-Romancecar website, click "Seat availability / Book / Purchase." 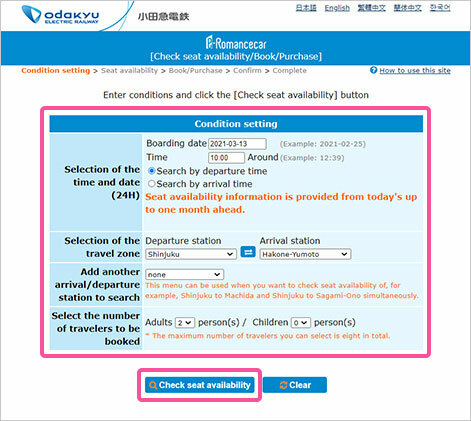 Set your search criteria (such as the date/time and number of seats) and click "Check seat availability." 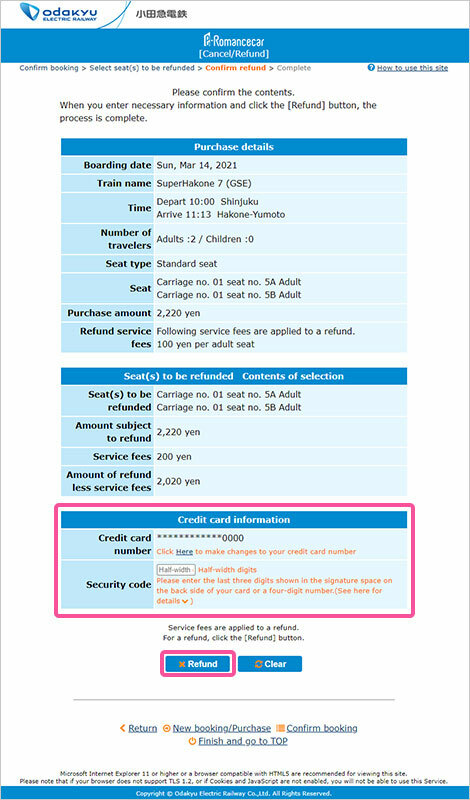 *If the specified point of arrival or point of departure is a station on the Gotemba Line, then only the vacant seat inquiry function may be used. 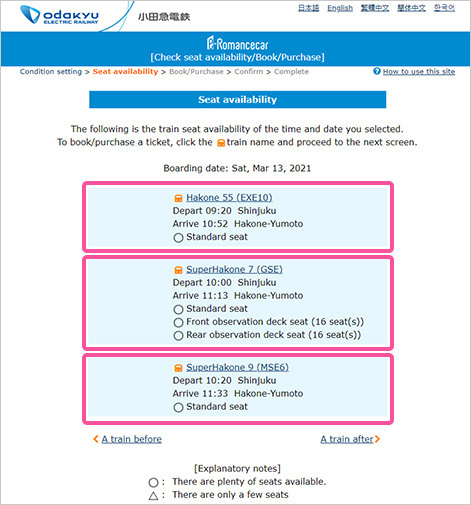 The available trains and seats matching your search criteria are displayed. Carriages with observation deck seats. Carriages with observation deck seats/saloons. 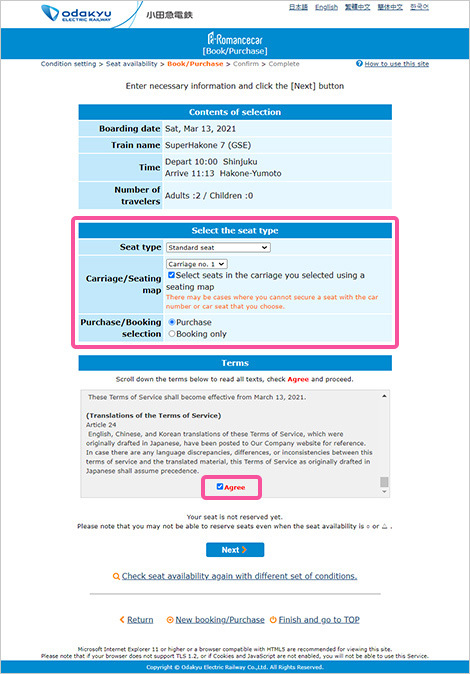 With your browser open to the e-Romancecar website, tap "Select a Seat, Book and Purchase"
Set your search criteria (such as the date/time and number of seats) and tap "Check seat availability." 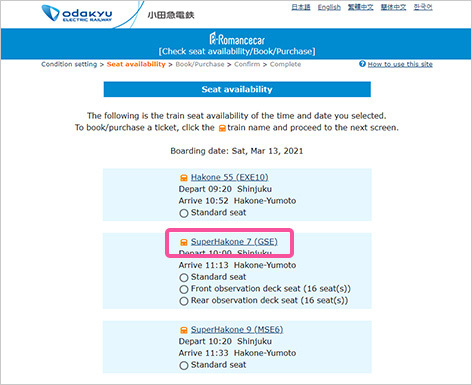 The available trains and seats matching your search criteria are displayed. If you see a desired seat, tap "Next" further below to purchase it. After you have found a seat, select the train name. 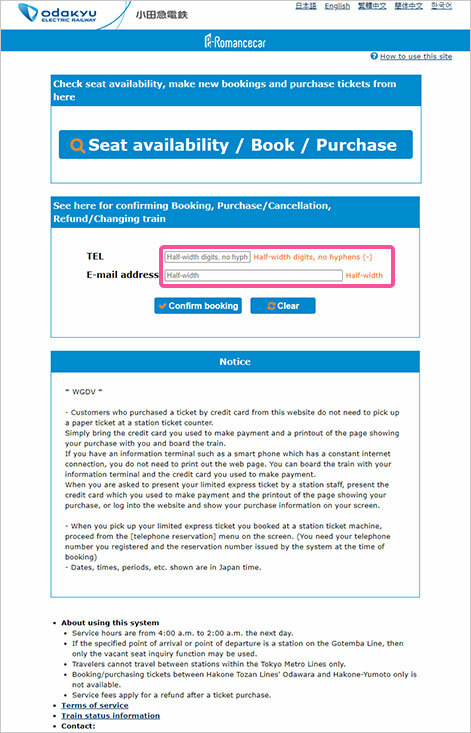 Select your desired seat type, car number, window or aisle seat preference and whether to purchase or reserve the seat. 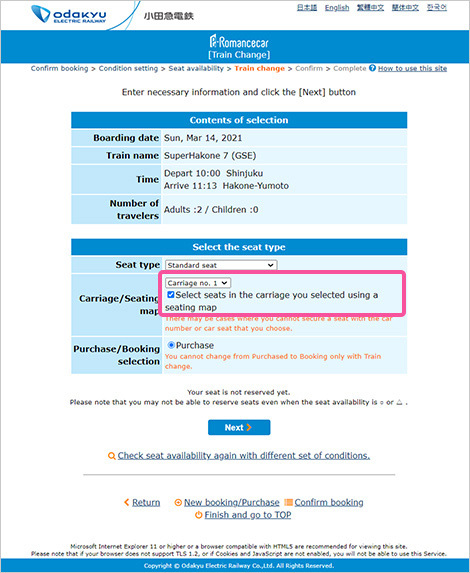 To specify your exact seat, check "Select seats in the carriage you selected using a seating map" and click "Next." A seating map will appear. Please note that some seats are excluded. To change the car number being displayed, simply specify the desired number. 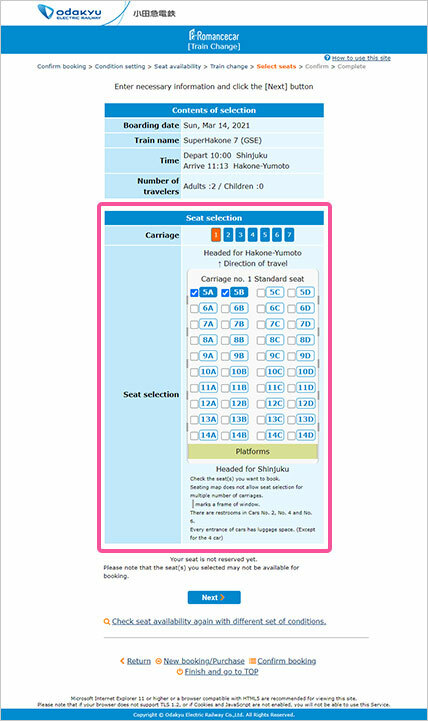 Most seats can be selected this way up to 45 minutes before departure. Confirmation of purchase will be displayed. 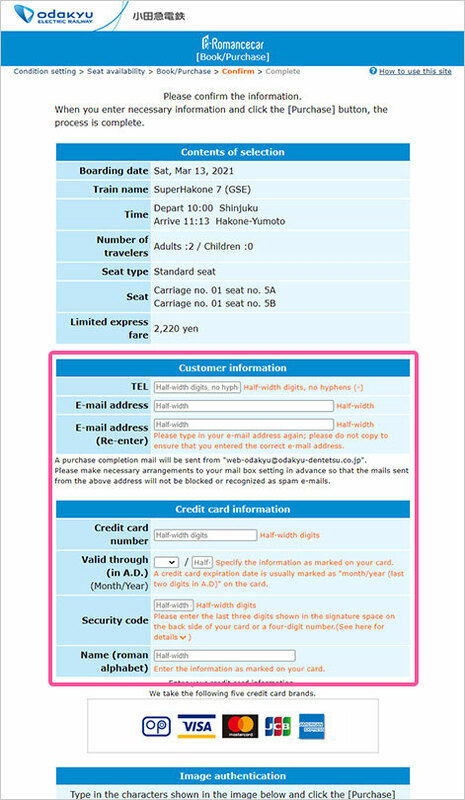 Print out this page and take it and the credit card used to make your purchase when boarding the train. 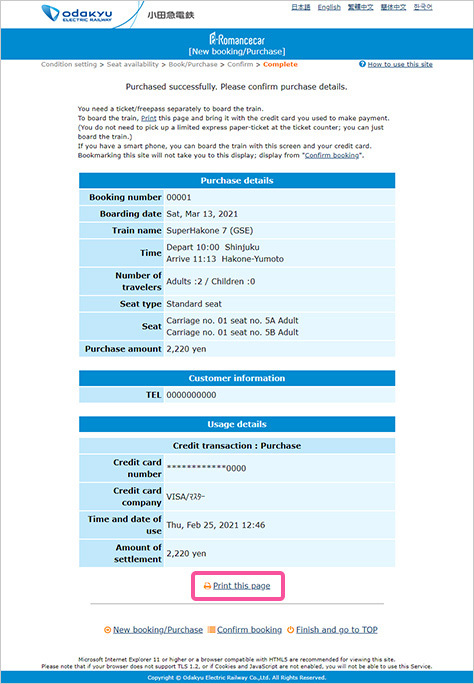 If using a smartphone, show proof of purchase from the "Confirmation of reservation" webpage. 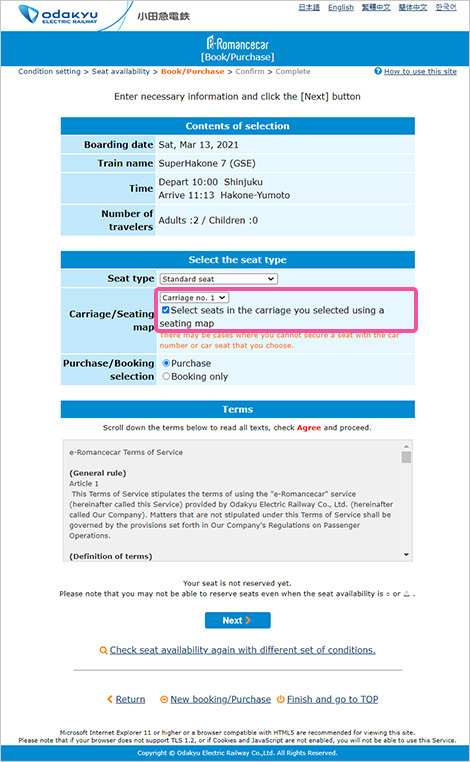 To specify your exact seat, check "Select seats in the carriage you selected using a seating map" and tap "Next." A seating map will appear. Please note that some seats are excluded. 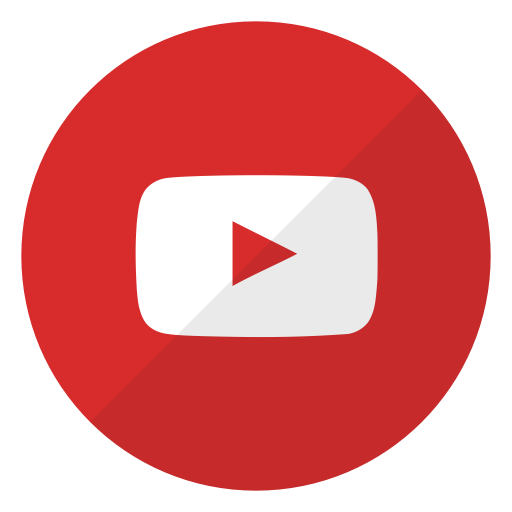 With the website open, enter the telephone number and e-mail address used when placing your reservation, and select "Confirm booking." 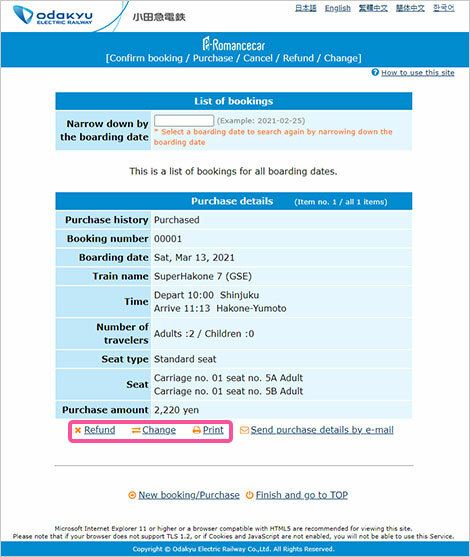 A list of your reservations will be displayed. 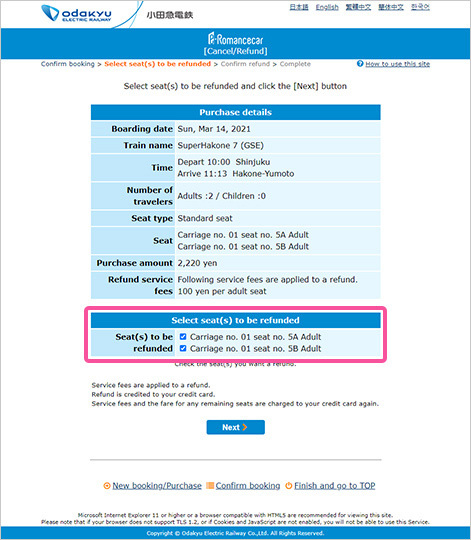 From the link below the purchase details, select "Refund" or "Change." 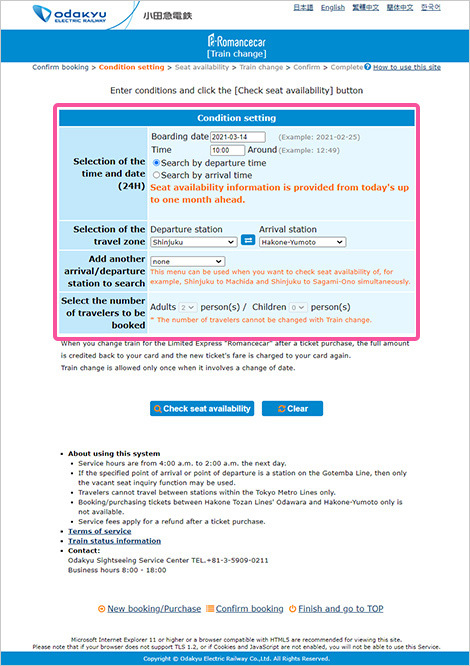 Enter search conditions (date/time of travel, train section, number of seats) and select "Find a seat." From this point on, the operation is the same as when you first booked the seat. 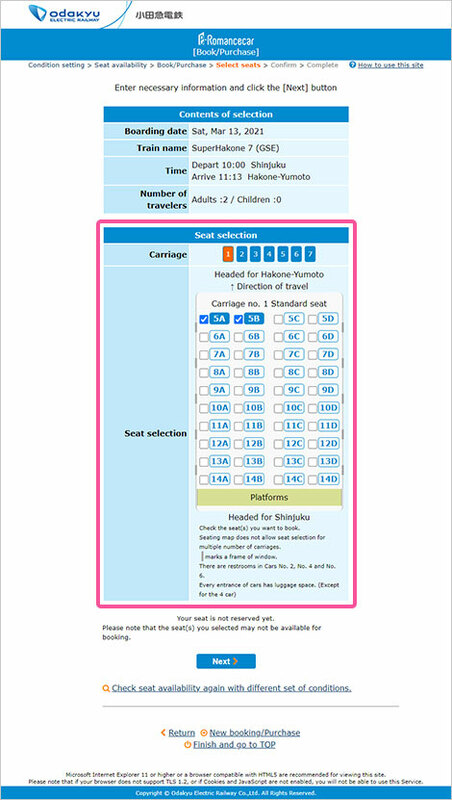 Seats can also be selected from the seating map if you change your train. To change the car number being displayed, simply specify the desired number. 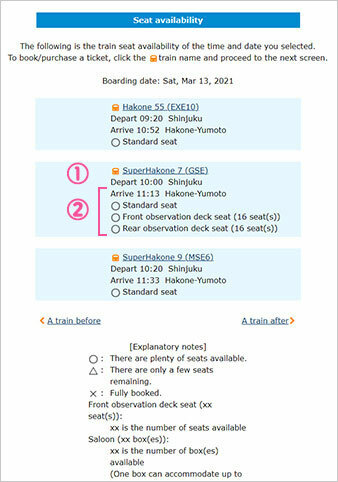 Most seats can be selected this way up to 45 minutes before departure. 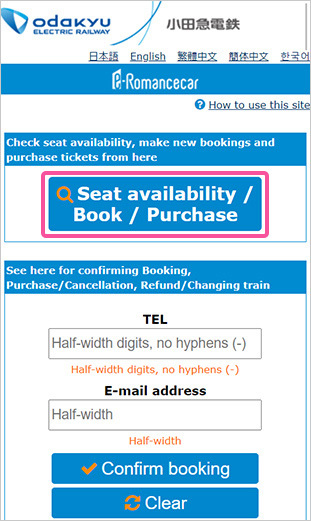 Your booked seats will be displayed. Check the box next to the seat for which you would like a refund, and then click "Next." 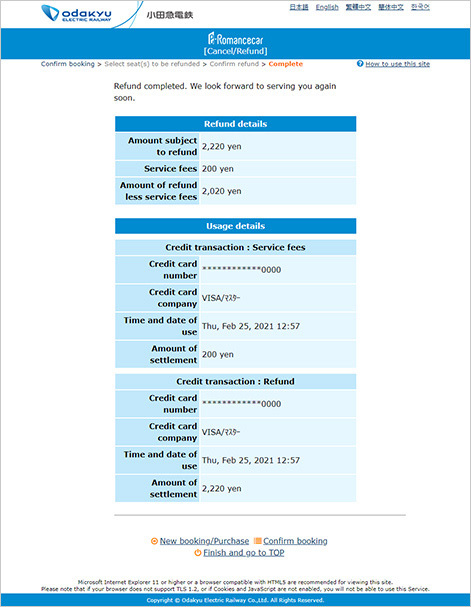 On the following page, select "Refund" to complete the refund process. Notes: A handling charge applies to refunds. When changing seats, check all the seats that are to be changed. Your booked seats will be displayed. Check the box next to the seat fo which you would like a refund, and then tap "Next." 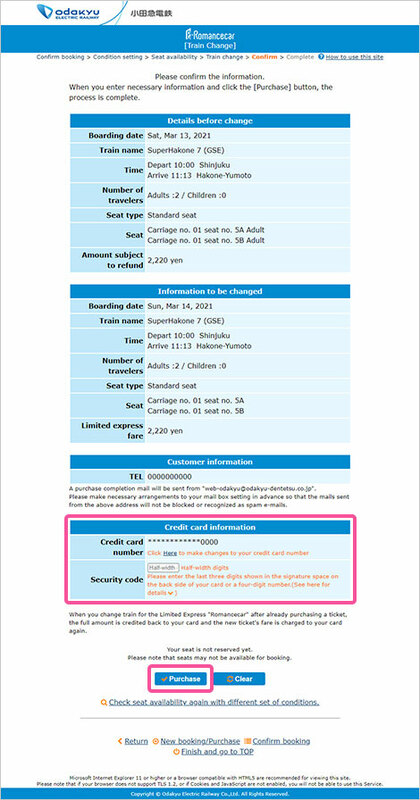 On the following page, select "Refund" to complete the refund process. For VISA, MasterCard and JCB cards, the security code is the three digits next to the signature portion on the back of your credit card. 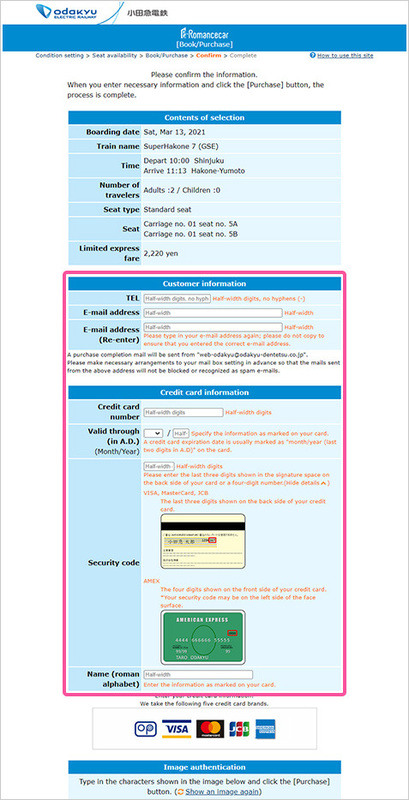 For AMEX, it is the four digits shown at the top on the front side of the code.